The noodles are cold, flat, jelly-like and they come floating on a mixture of vinegar, dried chillies and soy sauce. The taste is peculiar, the texture slippery. The noodles themselves are tasteless but the spices pack a punch. Together, they make for a most interesting combination on the palate. For Kathmandu residents, used to steaming hot noodles in a broth, laphing came as a surprise, and it has taken the city by storm. Laphing made its way to Kathmandu via Tibet, although it is originally from China. In the northern provinces of Gansu and Shaanxi, it is called liangfen and eaten during the summer. These mung bean strips are thick and translucent, unlike noodles that are usually thin and stringy. From China, liangfen made its way to the Tibetan plateau, where it turned into laphing. And from there, it was only a matter of time before it came to Nepal with Tibetan refugees. Laphing stalls have now sprung like mushrooms in every nook and cranny of the city. The intricate alleys of Boudha and Swayambhu—two sites that are home to a large number of Tibetans—are so crammed with laphing shops that the sound of knives swiftly hitting chopping boards as shopkeepers cut piles of noodles permeates the air. Bright colourful boards display the names of shops, while also advertising free WiFi. A cross-section of Kathmandu can be found at these shops, from college students to the elderly. At Tibetan Top Tasty Laphing Center in Boudha, one of Kathmandu’s oldest laphing joints, Sonam Tenzing Lama has been serving the cold noodles for the past 20 years. Lama, who is now 50, remembers eating laphing while growing up in Tibet. However, he only learnt to make the noodles in 1986, after he had moved to Kathmandu. Lama began selling laphing exclusively in Boudha and in the initial years, his customers were exclusively Tibetans. But that slowly started to change. Laphing is made from starch extracted from potato, mung bean or wheat flour. The extract is cooked overnight and left to settle, after which it is cut into long pieces that resemble noodles and dipped in a sauce made from vinegar, garlic water, soy sauce, salt, red chili paste, and sesame oil. But laphing purveyors have adapted the noodles to suit local tastes. A dry rolled version is available, along with more Nepali condiments like instant noodles and chips. “Our most popular variations are laphing with instant noodles and laphing with chips,” says Tamding Tsering of Cool Brothers Laphing in Ekantakuna. 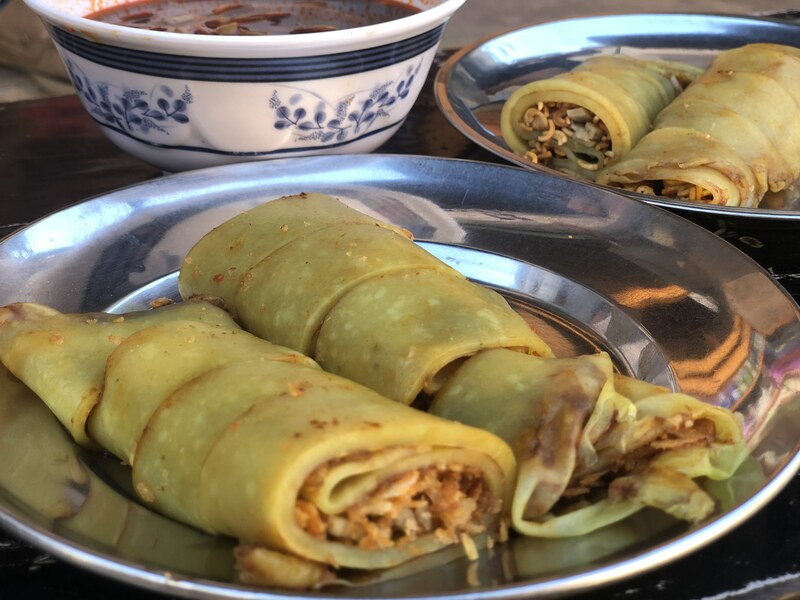 At Cool Brothers, a plate of laphing costs less than Rs 50, so it is quick, cheap and filling as a snack for college and school-going students. But other than its distinctive savoury taste and its affordability, Tsering attributes laphing’s popularity among young people to one more factor—social media. “Social media has helped our business grow a lot. We get many messages on our Facebook account—sometimes to ask for directions, other times to ask about our laphing. People tag us in pictures and because of this, more people come to know about our shop,” says Tsering. Cool Brothers is a small operation that looks more like a grocery store than a restaurant. It is operated by Tsering, his mother, his seven brothers and one sister. A continuous stream of customers throngs the restaurant throughout the day, keeping all members of the cooking and serving staff busy. The long benches and stools placed outside the shop are almost always occupied by customers. At peak hours, there is even a waiting line, with customers occupying the concrete deck of a house across the lane from Cool Brothers, waiting patiently for their plates.